Hi there!!! 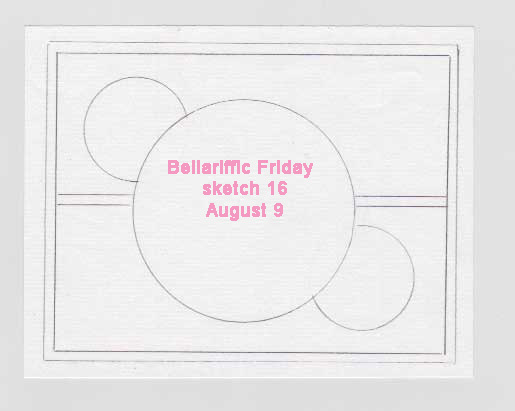 This week, we had a fun sketch to work with at Stamping Bella for Bellarific Friday. I decided to flip the sketch to make it vertical to add a bit of interest. Such a rebel!! 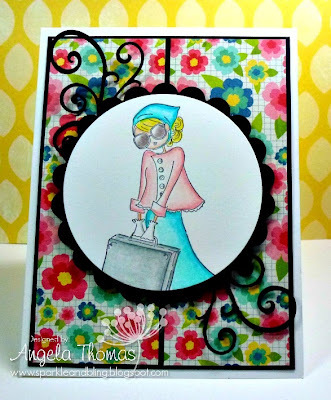 For my card, I've used the Uptown Girl Sunny is Stylish and have colored her with Prismacolor Pencils and Gamsol. 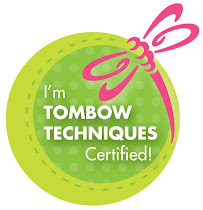 I'm thinking I may need to pull out my lonely Tombow Markers sometime soon. Rather than having the circle elements on my card I decided to switch it up a bit and use the black flourishes instead. I must admit I love the look of it. Next week our challenge is to use Polka Dots! Another easy one. Hope you can join us. 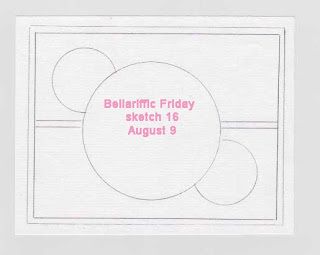 Just send a photo of your creation to Emily@stampingbella.com by Thursday to be included in the Friday lineup. And stop by the Blog to see some inspiration for the rest of the Sistahs. We have Bella Bucks up for grabs weekly for one lucky contributor and one commentor.